Get Acquainted with Current Passport Regulations – There are new requirements for motor travel between the United States and Canada. 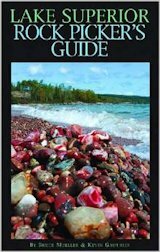 Travelers entering Canada from Grand Portage, MN should stop at the Ontario Visitor Center for maps and information relating to your intended trip. The staff is always quite friendly and helpful. They also have some discount coupons for lodging, restaurants and visitor attractions. 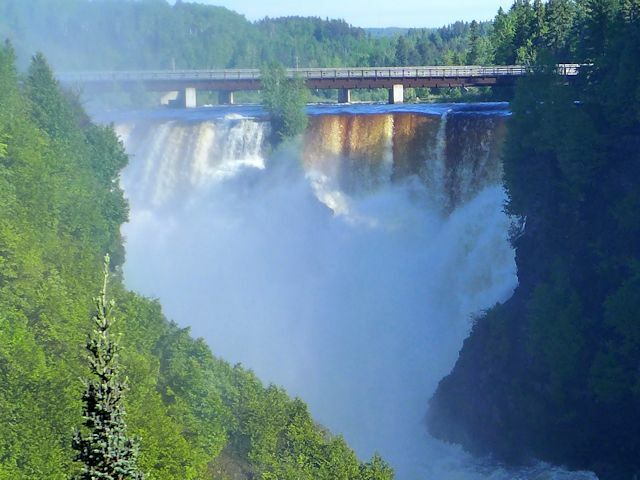 It’s 42 miles from the Ontario Visitor Center to Thunder Bay; slightly longer if you took a side trip to see Kakabeka Falls. Hwy 17 runs along the western edge of Thunder Bay so it is fairly easy to drive straight through without seeing much of the city. We’ve stayed overnight in the area many times, either at a motel or a campground. The best motels seem to be near the airport; The city operated campgrounds, Chippewa Park and Trowbridge Falls, in our opinion are only adequate – although Chippewa appears to be renovating their facilities so the camping may improve. For cleanliness, service and convenience, we gave the KOA campground on the north side of Thunder Bay high marks. The Provincial Park campground at Kakabeka Falls is very nice (about 15 miles west of Thunder Bay on Hwy 11). Figure 2 – 4 hours in Thunder Bay if you elect to see some of the sights. Add another 1 – 3 hours if you take in Fort William and/or Kakabeka Falls. Prince Arthur Marina Park – lake walks, harbor tours, great view of Sleeping Giant peninsula, pavilion with outdoor restaurant overlooking lake and ice cream parlor, overpass to downtown Port Arthur (now north Thunder Bay). Boulevard Lake/Centennial Park: picnic areas and walking trails. The entrance to Sleeping Giant (map & info here) is about 30 miles north and east of Thunder Bay. 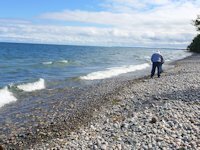 Due to being at least 30 minutes off the main highway (Hwy 17), visitors to Sleeping Giant should have at least 4 hours to spare to even begin to sample what it offers. Our visits to the park have always entailed an overnight or several day stay at their campground. The Giant offers several day hiking and nature trails, plus a number of longer backpacking trails and back country campsites. There are also mountain bike trails and a handful of interior lakes for canoeing. The village of Silver Islet is an interesting excursion and history lesson. If you are planning to overnight in the park and it is the peak season, call first for reservation status (1-888-ONT-PARK) to insure you don’t make the 30 mile trip only to be turned away. Quimet Canyon is a few miles off the main circle tour route but worth the effort. Between Sleeping Giant and Red Rock Ontario look for the turn off to Quimet Canyon Provincial Park. It’s a grand canyon like formation with two viewing platforms and a handicap accessible walking path. 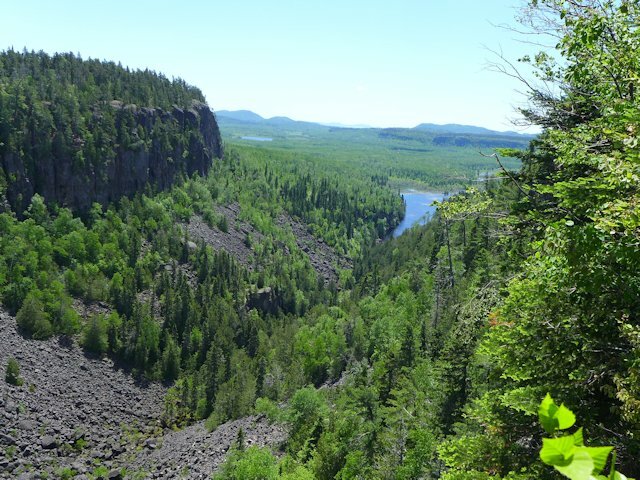 When you get to Red Rock, if you have time and are in the mood for a hike, take the turnoff to Red Rock and find the southern trail head for Red Rock-Nipigon River Recreation Trail. An hour round trip up and down a moderately steep trail will take you to two nice lookouts over Nipigon Bay. Back on the road, after you pass Nipigon keep your eye out for the Kama Bay wayside lookout. Great views of the Nipigon Bay islands. A few more miles down the road is the turnoff to the village of Rossport. Worth a visit, particularly if you are looking for a place for lunch or dinner. The scenic and protected Rossport Islands are a popular kayaking area. Also near Rossport is Rainbow Falls Provincial Park. A good park for hiking, canoeing, and boating. The trail to Rainbow Falls will require about a half an hour; you can extend the hike to a scenic lookout over Lake Superior by going another kilometer. Continuing your journey, as you approach Terrace Bay, don’t miss Aguasabon Falls and Gorge at the western edge of town. From Terrace Bay it is about 49 miles to Marathon. From the Minnesota border it is about 230 miles to Marathon.